Do police in schools make students and teachers safer? What, if any, role should local law enforcement play in enforcing a school’s code of conduct? When, if at all, should educators engage police to maintain order in unruly classrooms? How visible should law enforcement be in each public school? What responsibility should the local education system and/or the local police department have in overseeing a law enforcement officer assigned to a particular school? When a student is placed in out-of-school suspension, what steps can local law enforcement officers take to help that youth stay out of trouble? With a push toward putting more cops in schools, the need has never been greater to be clear on their purpose, selection, training, and oversight. These issues are among many being addressed by the national consensus-building project, coordinated by the Council of State Governments (CSG) Justice Center. The initiative has been convening experts in school safety, behavioral health, education, juvenile justice, social services, law enforcement, and child welfare. Youth, parents, and community partners also play a critical and active role in the project. The initiative’s goal is to provide recommendations and implementation guidance to minimize dependence on suspension and expulsion to manage student behaviors; improve students’ academic outcomes; reduce their involvement in the juvenile justice system (including alternative strategies to school-based arrests and direct court referrals when appropriate); and promote safe and productive learning environments. Millions of U.S. public school students in grades K–12 are suspended or expelled every year, particularly students in middle and high school. Research has revealed that when students are removed from the classroom as a disciplinary measure, the odds increase dramatically that they will repeat a grade, drop out, or become involved in the juvenile justice system. 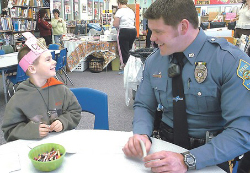 In jurisdictions that do not provide alternative educational centers for children removed from their schools, officers often find them on the streets where they are getting into trouble or being victimized. Juvenile court judges and administrators are understandably concerned about the large number of arrests by officers and referrals related to school-based incidents that are filling their dockets. Like law enforcement, they know what the negative long-term consequences can be for youth once involved in the juvenile justice system. The CSG Justice Center’s Law Enforcement Advisory Group met in October 2012, and will reconvene in March 2013 to continue these discussions. The group continues to hammer out recommendations related to the role of officers in public schools, particularly police engagement in areas of school safety and crime prevention, rather than minor disciplinary issues. Among the many additional issues under consideration are school/law enforcement partnerships that focus on appropriate diversion programs from the juvenile justice system, the clear articulation of law enforcement roles and responsibilities through MOUs, data collection on disciplinary actions and officer arrests to guide decision making, racial and other disparities in school disciplinary and criminal justice actions, school code of conduct reviews, information-sharing practices that help connect youth to needed services, and how crime in the community can affect school safety, as well as how incidents in schools can affect off-campus public safety. Of the nearly one million public secondary school students followed for more than six years, nearly 60 percent were suspended or expelled. About 15 percent of the students studied were suspended or expelled 11 times or more; nearly half of these students were also involved in the juvenile justice system. More than one in seven students studied had juvenile justice contact. And students that were suspended or expelled for a discretionary violation were nearly three times more likely to have contact with the juvenile justice system the following year. Repeated suspensions and expulsions predicted students’ poor graduation rates and the likelihood of being held back a grade. Only three percent of the disciplinary actions were for conduct in which state law mandated suspensions and expulsions; the rest were made at the discretion of school officials primarily in response to violations of local schools’ conduct codes. The project is administered in coordination with the Supportive School Discipline Initiative launched by the U.S. Attorney General and the U.S. Secretary of Education in July 2011 and is supported by a public/private partnership that includes the Office of Juvenile Justice and Delinquency Prevention, NoVo Foundation, The California Endowment, and The Atlantic Philanthropies. The work will result in a report that recommends better approaches to matching youth to appropriate interventions in ways that encourage greater academic successes and less frequent juvenile justice involvement. This work builds on a two-year CSG Justice Center collaboration with the Public Policy Research Institute at Texas A&M University to study nearly one million public school students in Texas. The Breaking Schools’ Rules report, released in 2011, describes how suspension and expulsion rates can vary dramatically, even among schools with similar student compositions. Although it is clear from the study that efforts in individual schools can make a difference, it is also evident that schools alone cannot make sweeping and lasting advancements without a commitment from law enforcement, courts, probation, treatment professionals, and the many other parties who can affect students’ success. As these issues continue to be debated, it is important that we broaden our discussions beyond just the headlines on shootings and inevitable stories of young children arrested for the most minor offenses, to ensure that we are not sacrificing a generation of children to the juvenile justice system in the name of school safety. Additional background on the School Discipline Consensus Project is available at https://csgjusticecenter.org/. Darrel Stephens is the Executive Director of the Major Cities Chiefs Association and the facilitator of the multidisciplinary Law Enforcement Advisory Group for the CSG Justice Center project. In addition to his experience as a police chief in several jurisdictions and a City Administrator, he is a member of the faculty at Johns Hopkins University Division of Public Safety and has also been the Executive Director of the Police Executive Research Forum. Work in Progress — From Tragedy to Healing: Oak Creek, Wisconsin | COPS Office Micro-Grants: Small Investments, Big Results | A Role for Officers in Schools | Training the Trainer: The PACT360 Learning Center | Crowd Management – The Retail Perspective | Did you know…?